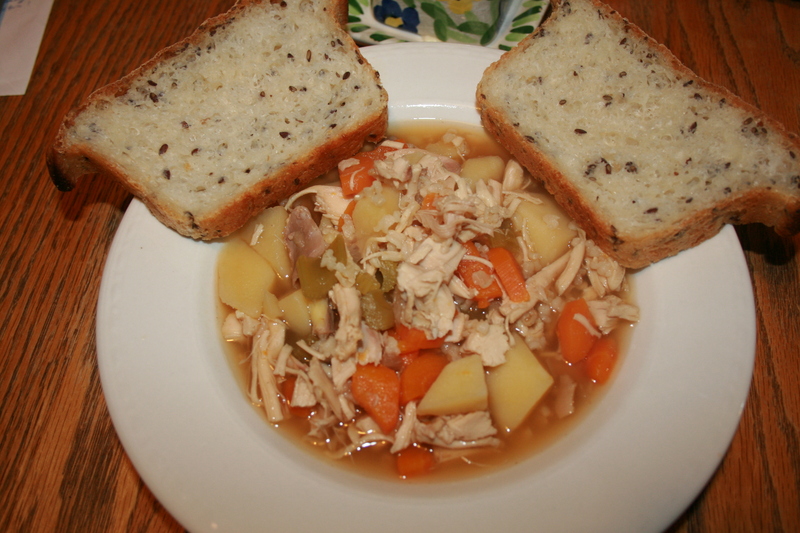 Grab enough veggies if you plan on making broth and soup at end of this recipe. 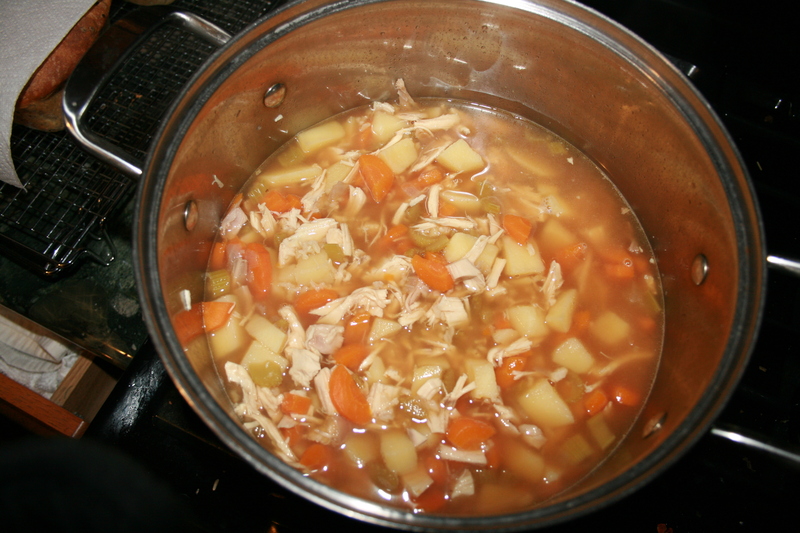 Would require about 1 pack celery, 6-8 large carrots, 4-6 med/large potatoes, noodles or rice. 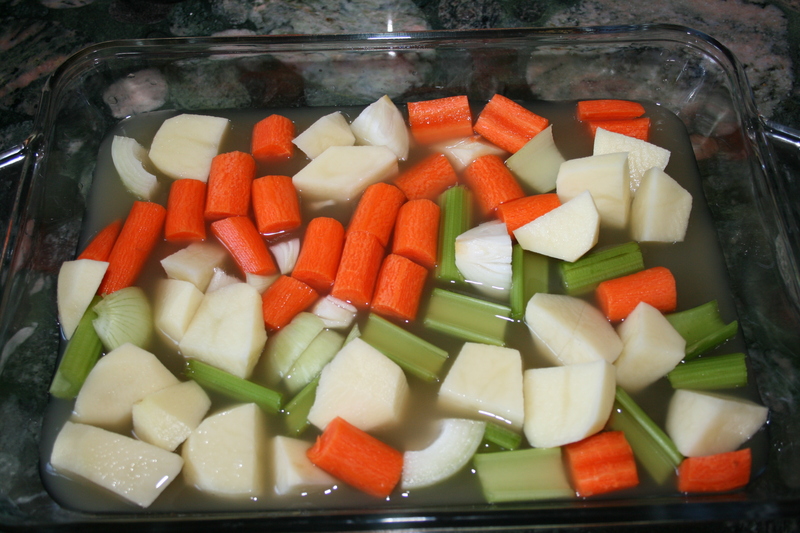 Preheat oven to 425 degrees – In the bottom of roasting pan add a layer of chunky onions, carrots, potatoes, celery and any other vegetables you’d like. 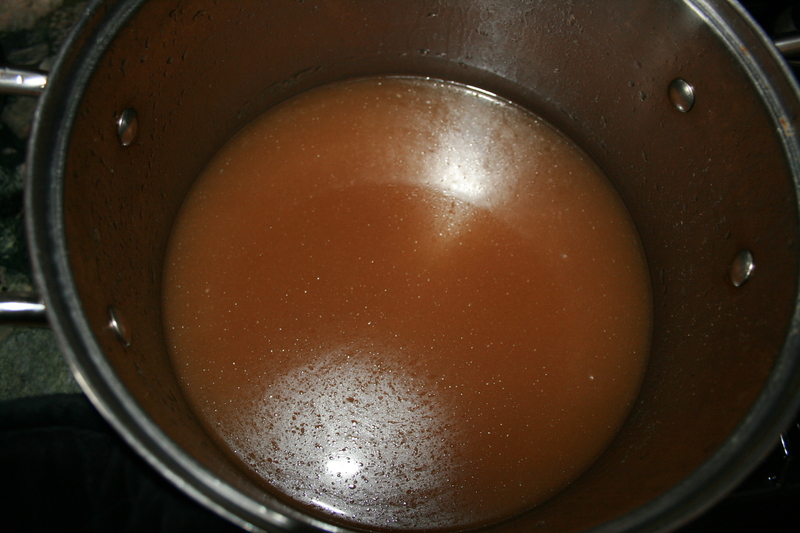 Add 1-2 cups of chicken broth. If no broth, add 1 cup water and some herbs. You’ll love the taste of these veggies with your meal. If you have any left you can save them for cooking up your broth. Pull out spices of celery salt, pepper, turmeric and thyme. Could also use garlic powder, rosemary & sage (or whatever you have of these herbs on hand or whatever else you’d like). 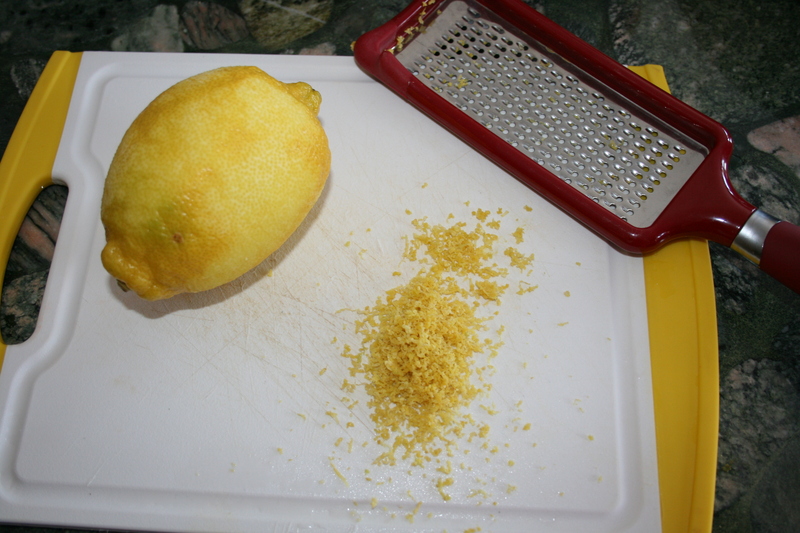 Zest lemon a little and slice off 4 thin slices, then quarter the rest of lemon. Stuff inside of bird with onion, lemon chunks and celery – sprinkle inside with herbs. Stuff some butter and lemon wedges under layer of skin. Rub butter or olive oil on top of bird and sprinkle with herbs. Place in oven breast up. Roast 30 minutes at 425 and check if breast is firm and just beginning to brown in spots. TURN OVEN DOWN to 350 Using tongs, turn the chicken breast-down, baste with juices if desired, sprinkle with herbs and roast for 20-25 minutes. Using tongs, turn the chicken breast-side up, baste again if desired. Roast for 20 minutes longer, until your thermometer inserted in the inner thigh registers 160-165 degrees and juices are running clear. Try not to overcook. 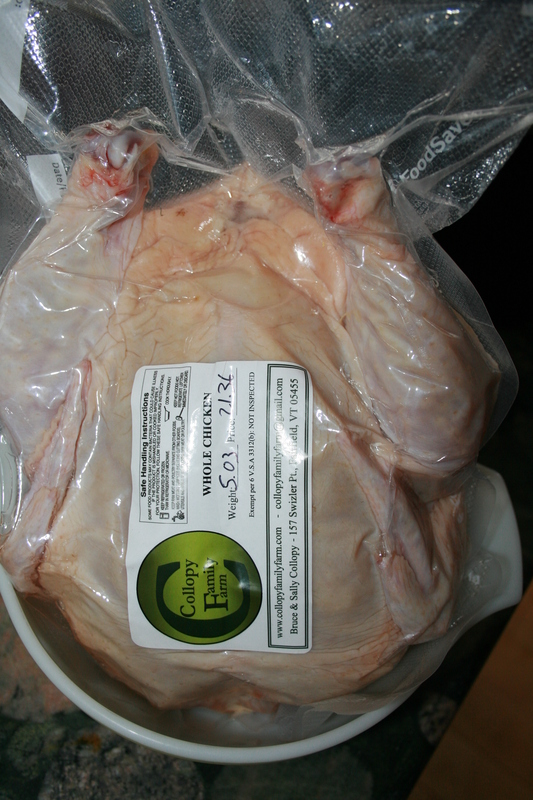 Transfer the bird to a cutting board and tent with foil. Remove some veggies from roasting pan to eat. Set the pan with veggies over med/high heat. 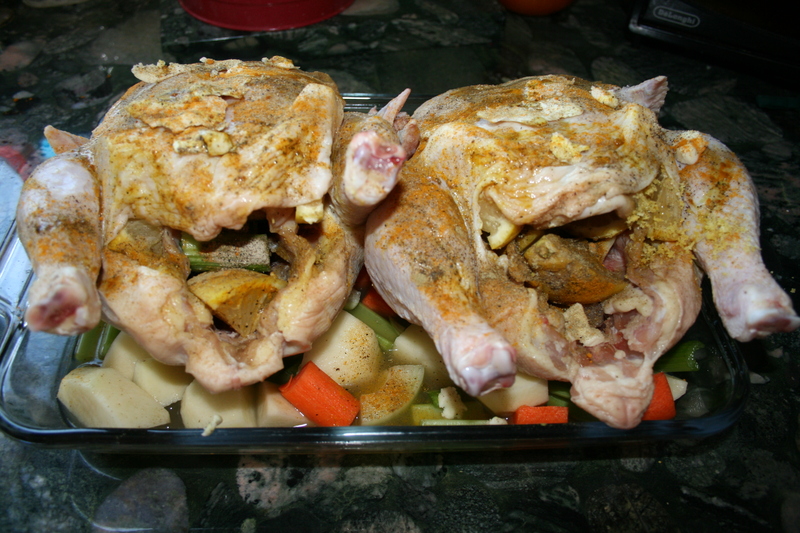 Add a little chicken broth or water, if needed, and cook, scraping up any browned bits. Press the lemon to release the juices. Smash veggies into sauce. May add a packet of gravy if you’d like to thicken. Carve the chicken and serve with lemon au jus gravy and roasted vegetables. 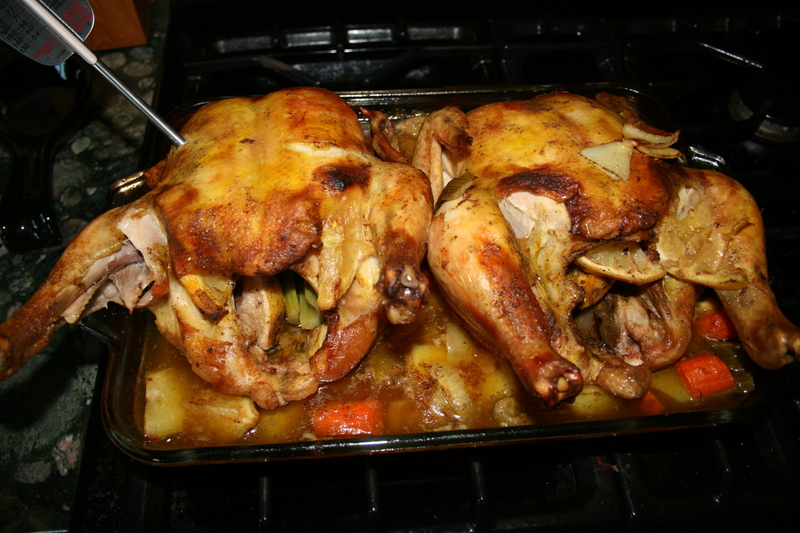 This bird is incredibly moist, melt in your mouth delicious!!!! BROTH: To make the most fabulous broth you’ve ever had – after you’ve finished eating, remove any remaining meat off the chicken, refrigerate to make soup tomorrow. 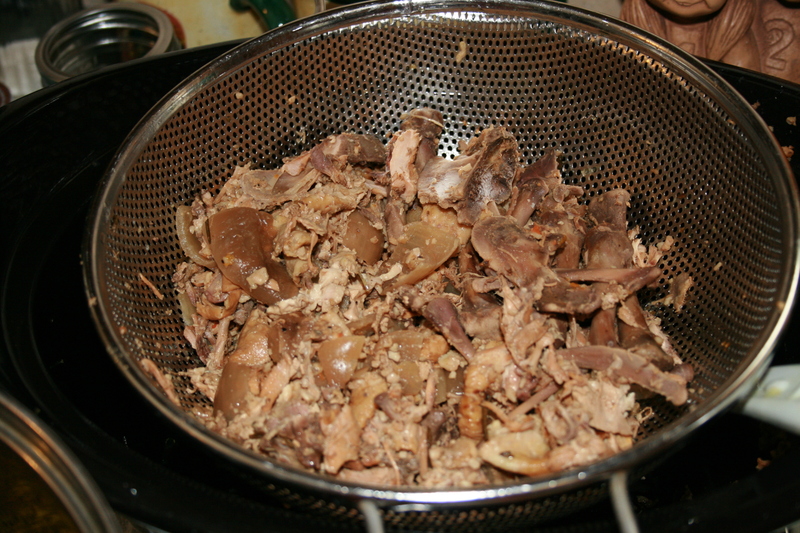 Toss all the bones and skin (yes carcass) into pan, cover with water and bring to a boil, then down to a simmer for 4-6 hours. Strain broth through a fine mesh strainer into clean pot. (I would not recommend eating veggies if you left them in pot. They could have fine bone splinters attached.) 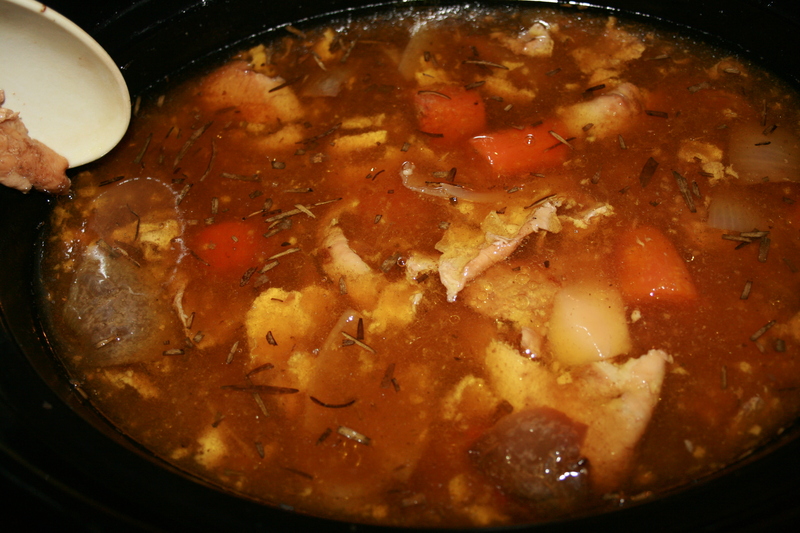 Chill broth on a cold winter porch or in fridge overnight. Skim off layer of fat.